The class-leading Kodiak 700 EPS Special Edition is ready and willing for work or play with cast aluminum wheels and new Backcountry Blue color and graphics. HIGH-PERFORMANCE ULTRAMATIC® TRANSMISSION: Kodiak 700's Ultramatic® transmission features a gated shifter, dual-range (Hi/Lo) drive plus reverse gear, and is the most advanced—and durable—CVT drive system available. An automatic centrifugal clutch maintains constant belt tension for reduced belt wear and a sprag clutch delivers natural all-wheel engine braking. ENGINE BUILT TO EXPLORE: Packing practical, fun and usable power, the Kodiak 700’s motor balances big bore power with a strong midrange. 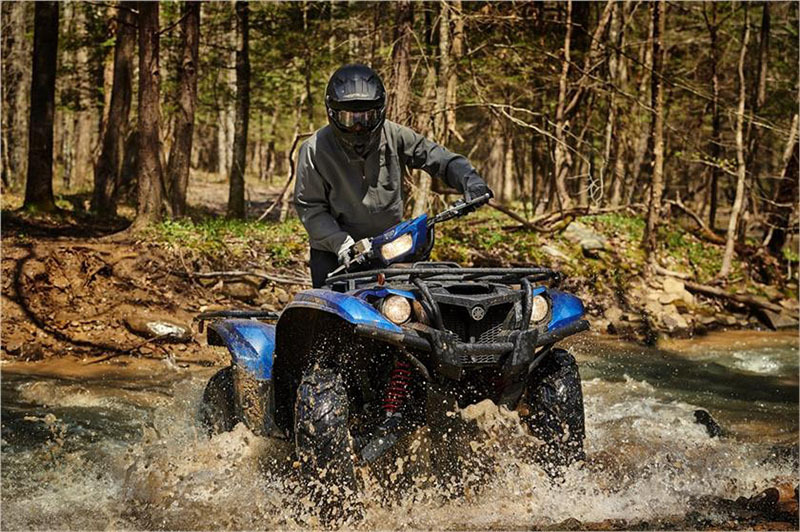 The 2019 Kodiak 700 EPS features a new 700-class engine with optimized torque, power delivery and engine character that is fun and exciting on trails while still being smooth and quiet when exploring trails or on the job site. 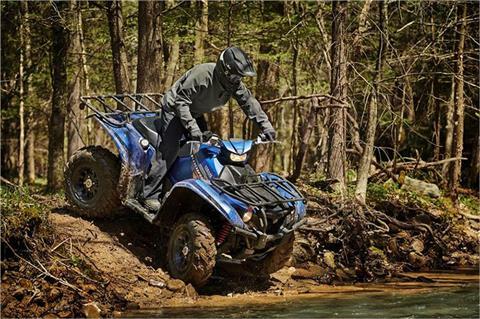 YAMAHA’S EXCLUSIVE ON-COMMAND 4WD: The three-position On-Command® 4WD system lets you switch between 2WD, limited-slip 4WD and a fully locked differential 4WD all with the simple push of a button. An override button allows engine to reach maximum rpm in full diff lock mode, and a straight driveshaft layout eliminates U-joints for reduced friction, noise, vibration, and maintenance. HIGH-MOUNTED AIR INTAKE: Tackle mud and water thanks to the Kodiak 700’s high-mounted air intake layout. The design increases power and torque while providing additional room for on-board storage and easy, tool-less servicing of the foam air filter. 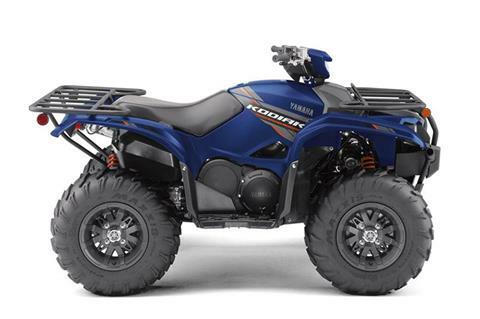 STAINLESS STEEL EXHAUST: To maintain clean-running performance for years, the Kodiak 700 EPS uses a stainless steel exhaust system and features a screen-type spark arrestor for great power with minimum noise output. HIGH-CAPACITY RADIATOR: Slow-speed technical riding can place a lot of thermal demands on a liquid-cooled motor, so the Kodiak 700 EPS features a high-capacity radiator with fan assist that delivers plenty of air flow for maximum cooling efficiency—and it’s positioned high in the frame for optimal protection. DRIVE SYSTEM AIR INTAKE: Specially designed, high-mounted drive system air intake helps reduce drive system temperatures and assists in keeping water and debris from entering the drive case. 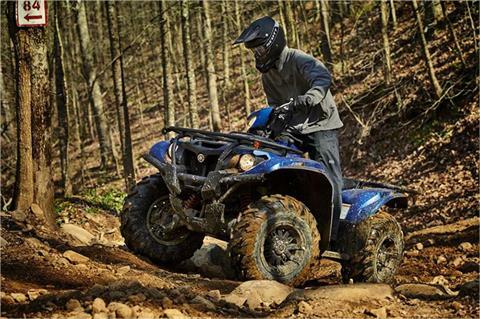 HIGH-PERFORMANCE TIRES: Maximizing available traction, the Kodiak 700 EPS features 25-inch Maxxis® tires that provide precise steering feel and feedback. 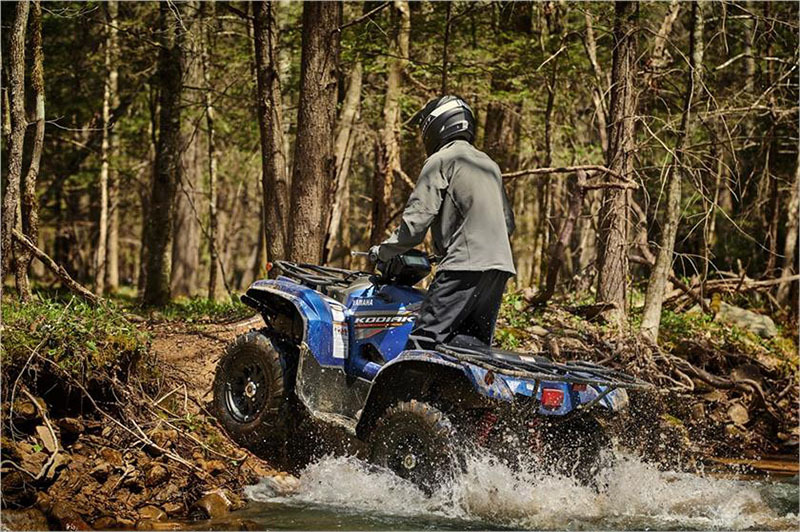 STRONG, DURABLE BRAKES: Strong and reliable braking comes standard on every Kodiak 700 EPS thanks to hydraulic front disc brakes matched with a sealed wet rear brake system. 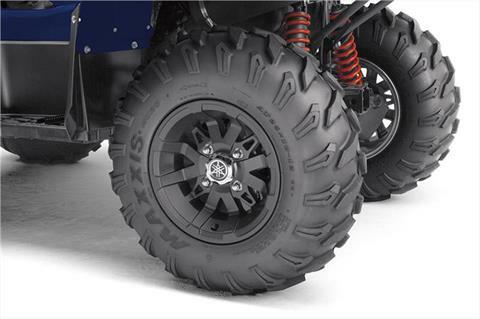 GENEROUS GROUND CLEARANCE: To handle nearly any terrain with ease, the Kodiak 700 EPS offers an impressive 11.3 inches of maximum ground clearance and full-length composite skid plates, for maximum underbelly protection. 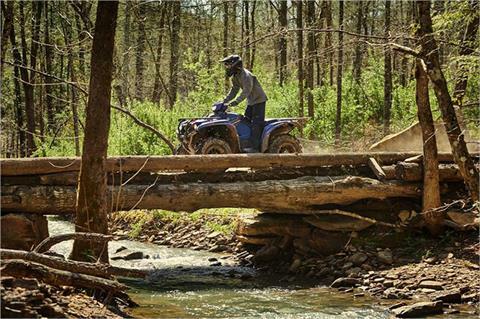 INDEPENDENT DOUBLE WISHBONE FRONT AND REAR SUSPENSION: Independent double wishbone suspension, with 7.6 inches of front wheel travel and 9.1 inches at the rear, provides excellent rider comfort even on the toughest trails, thanks to nitrogen-charged shocks with 5-way adjustable preload. 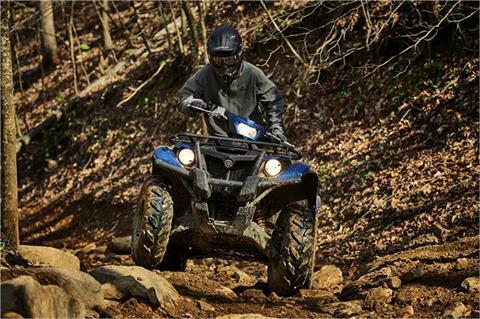 CLASS-LEADING POWER STEERING: Minimize fatigue and tackle every trail with ease thanks to Yamaha’s Electric Power Steering (EPS), the industry’s best balance of electric steering assist and positive trail feedback. UNDERSEAT FUEL TANK: An optimized 4.76-gallon fuel tank is located under the seat for excellent mass centralization and handling. COMPACT ERGONOMICS: A plush seat improves rider comfort for extended days exploring every trail, with plenty of room for the rider to move during aggressive riding. 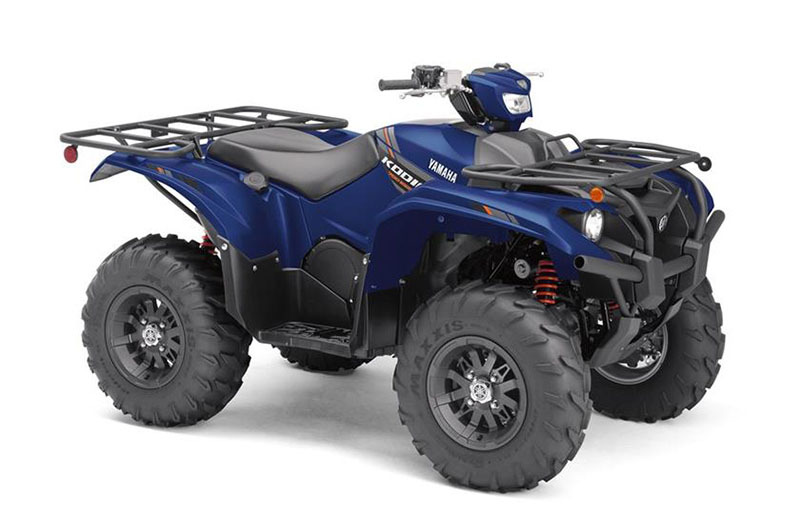 And despite the full-size performance, the Kodiak 700 EPS features a more compact body design similar to a mid-sized ATV, to ease overall feel and handling. INSTRUMENT PACKAGE: For 2019, the Kodiak 700 EPS receives a new instrument cluster with larger all-LCD readouts for visibility. AGGRESSIVE AND DURABLE STYLING: Rugged composite front bumper resists scratching and won’t rust, while injection-molded fenders and CV joint guards protect against rock and debris damage. BRILLIANT LIGHTING: Paired halogen headlights ensures good visibility, while a handlebar-mounted halogen work light provides additional illumination that moves with rider input for added flexibility. The LED taillights are bright and long-lasting, too. READY FOR ACCESSORIES: The Kodiak 700 EPS was engineered in concert with a range of accessories for perfect fit and function, for nearly every type of ride you can find. With a standard 12V power point, you can keep devices charged, too. EXTENSIVE CARGO CAPACITY: Rugged, large-diameter steel cargo racks with durable wrinkle paint finish can pack a total of 308 pounds combined (110 lb. front, 198 lb. rear). An on-board storage compartment keeps things dry, too. WORK-READY TOW CAPACITY: Center-mounted, heavy-duty two-inch receiver comes standard on Kodiak 700 EPS and can tow more than 1,300 lb. 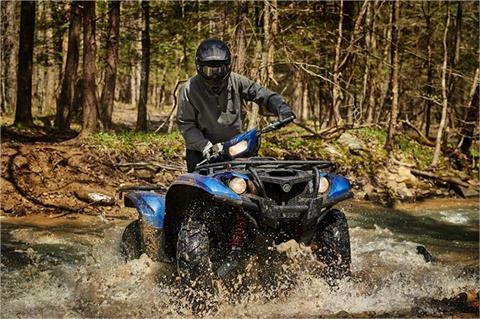 BUILT REAL WORLD TOUGH™, ASSEMBLED IN THE USA: As with other Yamaha ATVs and Side-by-Sides, the Kodiak is assembled in the USA to meet Yamaha’s exacting standards for durability and reliability. 700-CLASS ENGINE: For 2019, Yamaha’s engineers wanted to boost the midrange performance of the big bore Kodiak 700 EPS even further, to put power right where you use it most. At the same time, the new motor features redesigned engine mounts, so despite the increase in performance, it runs even smoother than before. BIG BORE ENGINE BUILT TO TACKLE THE REAL WORLD: Rebuilt for 2019, the Kodiak® 700 EPS combines big bore power without losing an ounce of comfort, thanks to its new 700-class engine with improved midrange power, and gearing designed for low rpm cruising and smooth-running motor mounts. HIGH-PERFORMANCE ULTRAMATIC® TRANSMISSION: Yamaha’s class-leading transmission combines immediate response with advanced features like natural, all-wheel engine braking for control on confidence. And, of course, the Ultramatic is proven to be the most durable ATV transmission on the market. 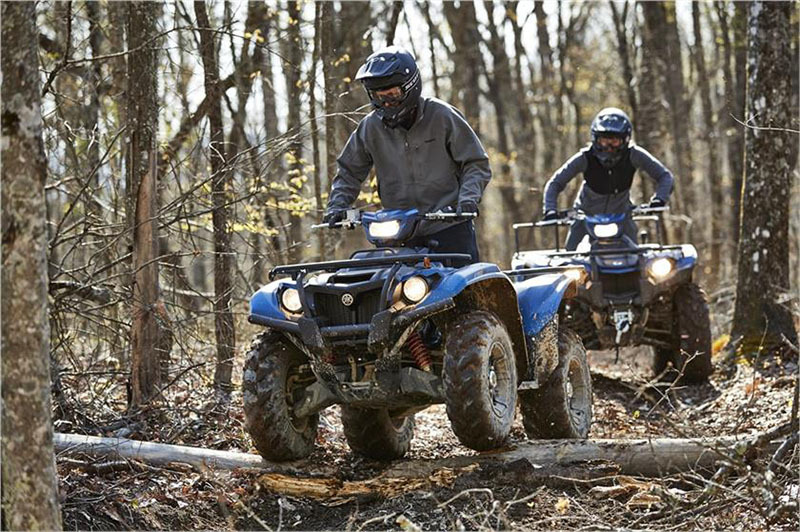 TRAIL-READY CHASSIS: With plenty of ground clearance and adjustable suspension, the Kodiak 700 EPS tackles rough terrain with ease. Wide-arc A-arms and full-body skid plates ensure the Kodiak 700 EPS is able to handle anything the farm or trail can throw at it. 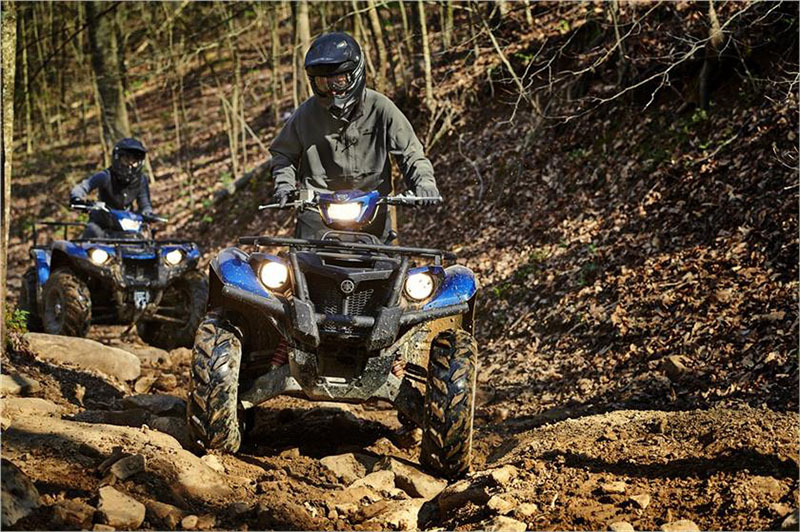 CLASS-LEADING POWER STEERING: Reduced fatigue, excellent control and trail feel all come standard with Kodiak 700 EPS’ best in industry speed-sensitive Electric Power Steering (EPS). Front rack - 110 lb. ATVs are recommended for those aged 16 years and older. YAMAHA recommends an approved training course. See your dealer or call 1-800-887-2887. ATV’s can be hazardous to operate.